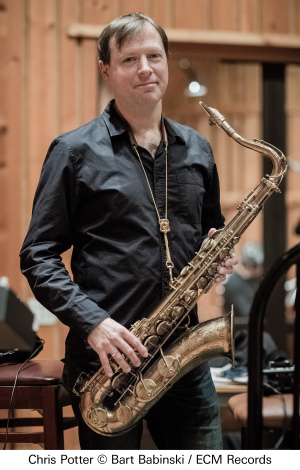 Imaginary Cities, an album of great power and expressive range, is the recording premiere of saxophonist Chris Potter’s new Underground Orchestra. At the core of this larger ensemble is the personnel of his long-established Underground quartet – with Adam Rogers, Craig Taborn and Nate Smith – now joined by two bassists, a string quartet, and Potter’s old comrade from Dave Holland Quintet days, vibes and marimba virtuoso Steve Nelson. The title composition is a suite, panoramic in its reach, with movements subtitled “Compassion”, “Dualities”, “Disintegration” and “Rebuilding”. The scope of the work, and its contrasting moods and thematic continuity, inspire some of very Potter’s finest playing, including some extraordinary solos. His saxes fly high above his imaginary cityscapes or launch into dialogues or group improvising with its gifted inhabitants. Four further pieces – “Lament”, “Firefly”, “Shadow Self” and “Sky” – extend the feeling of the suite, successfully combining both tightly written material and very open areas involving all members of the orchestra. References are multi-idiomatic and multicultural, and Potter, who counts Charlie Parker with Strings amongst his formative enthusiasms, had Arabic and Indian string sections in mind, as well as contemporary composition, when shaping this material. The track “Shadow Self”, meanwhile, reflects the influence of Béla Bartók. 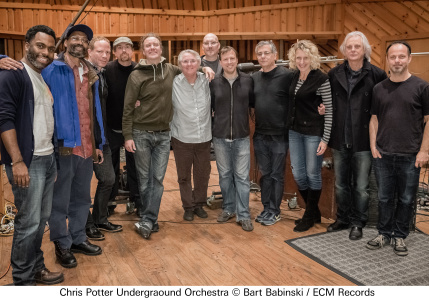 Potter assembled the Underground Orchestra originally in response to an invitation to present music at Jazz at Lincoln Center in New York. “There was an idea that it could be something that I hadn’t done before. So I started with the Underground quartet, with Craig Taborn on acoustic piano in this case [as opposed to the Fender Rhodes he usually plays in the small group] and then kept adding more and more players. No bass player in the Underground group? Well, I’ll have two this time. In my mind I was hearing a real thick rhythm section sound, also with vibraphone and piano. The way Fima [Ephron] and Scott [Colley] play together and improvise together makes a lot of things work in this music. And then the strings … eight or nine years ago I’d done an album called Song for Anyone where I’d written a little for strings. I didn’t want a classical-meets-jazz feeling. I wanted it all to be completely integrated. And, in places, the lines between the written material and the improvised material would be a little blurred, and the strings would improvise, too.” Not the least of the achievements of Imaginary Cities is the way in which Potter has extended the tremendous rhythmic drive of his Underground band into his music for the larger group. The concept of the four movement structure of “Imaginary Cities” emerged slowly: “It really evolved from the writing. I had this idea of imaginary cities, a non-specific utopian idea of how the modern city could be better. Not that I’m writing a manifesto of what I think urban planning could be…It just seemed like a compelling way to organize my thoughts. It started out just being one tune and then I saw how one theme could migrate to another mood and continue it and be another aspect of the same thing. So it ended up being four movements with thematic development through the whole thing.” Potter says that he conceives of the whole album – the suite and the four additional songs arranged for the same musicians – as one unified sound. Imaginary Cities was recorded in December 2013 in New York’s Avatar Studio and produced by Manfred Eicher. Release of the album is followed by US performances with the Underground Orchestra in New York and San Francisco.